Advice, answers, contact details or support information can all be found here. For further information call us on +441326 341313, or e-mail sales@bareknucklepickups.co.uk. ​A calibrated set of humbuckers (or single coils for that matter) are pickups wound to optimise tone and output for their respective position. For example, the bridge and neck humbuckers are wound differently and often feature different magnets too. The strings move much more over the neck pickup and generate more current, so neck pickups are often wound to have a lower output in comparison to a bridge in order to achieve better clarity and balance between the pair. The best way to think of a calibrated set is as a matched pair. Braided two conductor hook-up allows series operation only (humbucking), whereas four conductor hook-up allows advanced wiring options such as series/parallel, in/out of phase and coil splitting. "Spacing" refers to the distance from E pole to E pole on the bridge pickup of a humbucker equipped guitar. Standard spacing, usual with fixed Gibson style bridges, is 50mm (it's actually 49.4mm on BKPs as per the original Gibson PAF but is rounded up to 50mm in the industry). Wide or F (Fender) spacing is typical of tremolo equipped guitars and is 53mm as per original Fender spacing. The majority of Gibson guitars are standard spaced, although they have occasionally used a wide spaced bridge on some SG and Flying Vee series. PRS, despite fitting standard spaced humbuckers as stock, are actually wide spaced on their tremolo equipped guitars. Neck pickups are always standard spacing. If in doubt, get the ruler out! A stock middle coil will have more mid-range on the middle positions of the 5 way selector and not be hum-cancelling. You'll also notice marginally more volume across the whole set of 3 coils. Fender Strats originally came with 3 stock wound/polarity coils. RWRP middle coil will hum-cancel in positions 2 and 4 of the 5 way selector, which is arguably more versatile than a stock middle coil and was popularised by players like Mark Knopfler and Eric Johnson. A "vintage stagger" handles the heavier 7 ¼" radius of a vintage fingerboard and works well right up to around a 10" radius. The stagger is how Leo Fender heard the strings balanced the best, and we use the more common '56 stagger with the E/A magnets at 17.6mm, D/G magnets at 18.4MM, B magnet at 16mm and high E magnet at 16.8mm. We can also produce the earlier '54 stagger with low G pole on request. Flat magnet profile gives better string to string balance on modern radius finger boards of 10" and flatter. At the end of the day it's a matter of preference and what works best for the individual. Some players use a vintage stagger on very flat fingerboard radii of 14" and love it! What is "four conductor wiring"? "Four conductor wiring" is the individual termination of the start and finish leads from each coil of a humbucking pickup to a cable with four separate conductors plus a shield. This allows extremely versatile switching arrangements such as series/parallel, coil split, in/out of phase and so on. What is the Bare Knuckle "Four conductor colour code"? The colour code we use goes like this: Black: Start of screw coil; White: End of screw coil; Red: Start of slug coil; Green: End of slug coil. For standard series operation, solder the red to the pot tag, the black to ground (usually the back of the pot casing) and solder the green and white together. Put simply, yes. If you decide after buying a Bare Knuckle humbucker that you'd prefer four conductor wiring, we can change it over for a charge subject to return of the pickup by registered mail. If you purchased your pickup through a Bare Knuckle Main dealer then please conduct your return through them. We are happy to remove covers free of charge as part of our commitment to customer service so that your warranty isn't invalidated as long as the pickup is returned to us by registered mail. Please contact us before sending any pickups to us, as we don't accept unsolicited mail. The Bare Knuckle warranty is for life to the original purchaser subject to returning the registration form. The warranty is non-transferable and does not cover damage through misuse or improper handling, normal wear to covers, installation charges or any form of modification or repair undertaken by anyone other than Bare Knuckle Pickups Ltd.
"DC resistance" is the resistance to the flow of Direct Current. In practice it is used as a very general indicator of a pickup's power, with a higher DC reading yielding more power and a darker sound. However, the gauge of the wire also has enormous bearing on the sound; different wire with similar DC readings will not have the same power or sound. As always, let your hands and ears be the judge. "Resonant peak" is the frequency that the impedance of a pickup is at its highest. A higher resonant peak usually indicates a brighter, more open sound within a certain type of pickup, i.e. humbuckers or single coils. See also: "What is a pickup's impedance?" What is a pickup's "impedance"? A pickup's "impedance" is a measure of the resistance to the flow of AC (guitar signal). Reverse wind/reverse polarity is used with reference to a common modification to the middle pickup on a Strat. With a 5 way selector a RW/RP middle pickup will act as a humbucker when combined with the bridge and neck pickups in positions 2 and 4. The magnetic polarity and the wind direction of the pickup is the opposite to the other coils on the guitar. This enables a stock coil and RW/RP coil to be wired together in parallel or in series, allowing hum-cancelling operation. This modification is common to Strat®, Tele®, P90 and P&J Bass coils. In fact, anywhere that hum-cancelling is required from 2 or more single coils. See also: "What is polarity?" "Polarity" is the relationship of positive and negative electrical current, or magnetic poles to each other. When a coil has been wound it is immersed in a mixture of paraffin and beeswax to solidify the coils and help guard against microphonic feedback. Our contemporary coils are all wax-potted. See also "How We Make Them". Scatterwinding is the process of guiding fine copper wire by hand in a random or scattered pattern around a bobbin that is spun by a machine. True scatterwinding can only be done by hand and requires a degree of skill to get the required tension to create consistent results. To a certain extent each pickup will be unique and have its own character, however this will always be within the boundaries of its specification. For instance, no two Riff Raff humbuckers will be identical but they'll both have the same number of winds, the same wire, the same magnet and therefore very similar overall sound characteristics and performance. See also: What is Scatterwinding? How do scatterwound pickups sound different from machine wound ones? Scatterwinding by hand can be time consuming but it has many advantages over conventional machine winding, not least a far superior sound. When a coil is scatterwound, the wire isn't as close or even, layer on layer, as with a machine and this lowers the distributed capacitance that exists between the turns of the wire. Lower capacitance allows more top end, the resonant peak increases slightly and the pickup has a flatter frequency response across its range. The result is a clearer, more open sound that has the impression of being louder purely by the amount of extra detail and dynamics present that scatterwinding has created. A humbucker consists of two coils usually wound in the same direction, however the electrical path to ground travels in opposing directions in each coil and the magnetic polarity is reversed. The humbucker is designed to cancel out 60-cycle hum and has a fatter, richer sound to that of the taller, narrower single coil that can be prone to 50/60 cycle hum. Yes, our pickups can be used alongside the majority of other manufacturer's pickups, although it is always wise to check the polarity and wind direction, especially in the case of single coils, as occasionally the polarity or wind direction may be different. It is always best to get a coil wound correctly and the right magnetic polarity from the outset so if you are in any doubt please contact us and we'll make sure you get the correct information to make an informed choice. 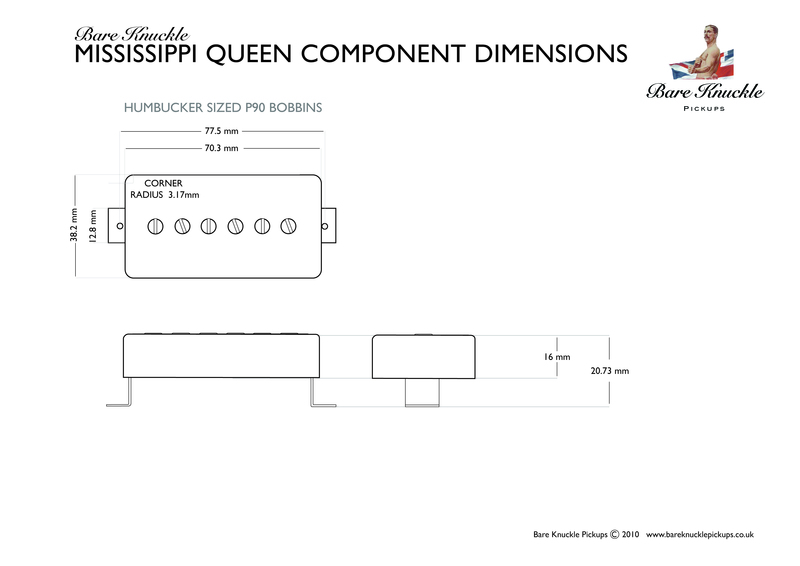 All Bare Knuckle humbuckers are available in 50mm (Gibson) and 53mm (Fender) spacing. Single coils are 52mm spaced as standard. Pole spacing relates to the distance from the centre of the first pole screw to the centre of the sixth. Adjusting the height of a pickup is essential to obtain the best sound and volume balance with the other pickups on the guitar. More volume and power are present closer to the strings; the pickup will sound clearer further away but it will have less output. Start by adjusting the bridge pickup close to the strings whilst barring across the strings at the highest fret of the guitar. Adjust the pickup away from the strings until no overtones or false harmonics are heard and the best balance of power and clarity is achieved. Once the bridge pickup is adjusted for maximum performance the other pickups on the guitar can be adjusted by ear to gain optimum volume balance. If you follow our wiring schematics then pickup installation is quite straightforward, as long as you work carefully and methodically. Always use a soldering iron of at least 25 watts and make sure it is at full temperature before starting. 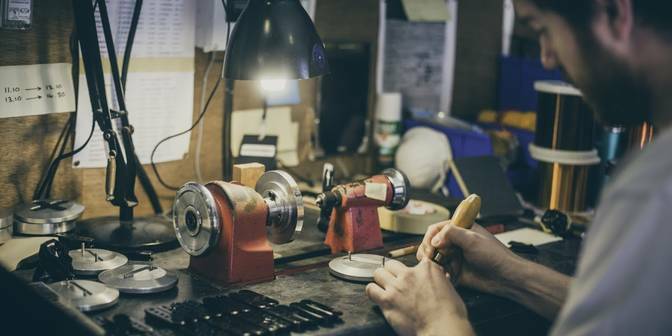 Check all surfaces that require soldering are clean and free of grease before separately tinning all wires and surfaces to be connected with hot solder. If you have any doubts or have never installed a pickup, get a reputable guitar technician to do the job for you. As always, if you have any questions at all then contact us and we'll help as much as we can. Does it matter which way around a pickup is fitted? Bare Knuckle humbucker designs feature both symmetrical and asymmetrical coils. Traditionally the screw coil goes nearest the bridge and nearest the neck respectively, but feel free to experiment for optimum tone. Do drop us a message if you get stuck. The volume pot is typically 250K or 500K, the higher the value the brighter the sound. Historically Gibson has always used 500K pots and Fender 250K pots but it pays to experiment. Give us a shout if you get confused. What are zinc-plated steel baseplates? 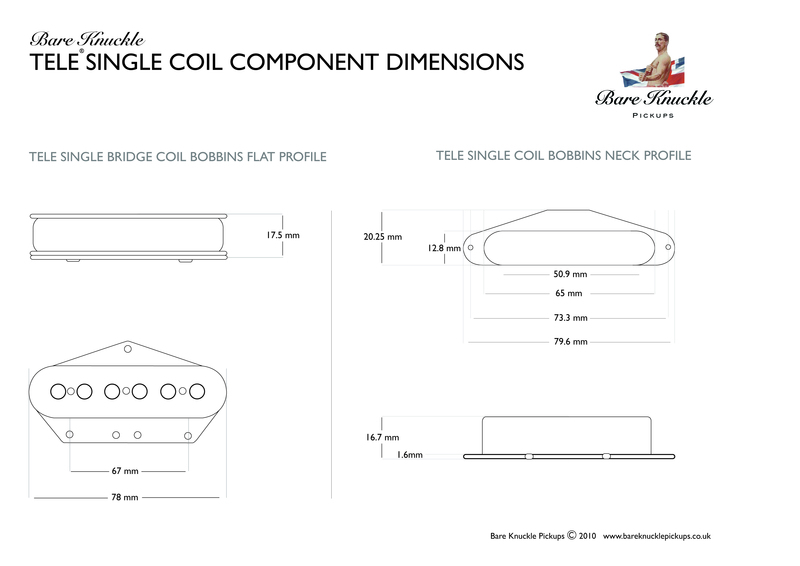 Zinc-plated steel baseplates for Strat coils add more bottom end definition, clarity and power to the coil. They work on the same principle as a Tele bridge baseplate, with tapped mounting holes so height adjustment screws thread directly into the baseplate, ensuring it will never fall off. The baseplates are wax potted with the coil to prevent microphonic feedback. Whilst it is most common to fit one to the bridge coil only, the zinc-plated steel baseplates work well on middle and neck coils too. What is the difference between vintage long-leg and short leg baseplates? The 1/2" vintage long-leg humbucker mounting is common on Gibson guitars, or any guitar with a generous pickup cavity. The shorter 1/4" long humbucker mounting leg is more suited to shallow routed/slimmer bodied guitars such as Strats and PRS, etc. What is the Tele 4-way mod? By adding a separate ground-wire to the Tele neck cover it is possible to wire a Tele set to a 4 way switch, which will give the additional option of both bridge and neck in 'series' (as opposed to the standard 'parallel' mid setting). 4 way switch settings are : 1. Bridge 2. Bridge and neck in parallel 3. Neck 4. Bridge and neck in series. This mod works the best on 'stock' wound Telecaster® coils as opposed to RWRP. 2 conductor + screen provides the start and finish of the coil and a separate ground, making it easier for series or parallel connections with more than one coil. Braided 2 conductor has a single internal conductor and the braided jacket is effectively the other conductor and used as ground. The very first humbuckers from the '50s were not wax potted and the practice of immersing coils in wax to prevent microphonic squealing didn't become common place with humbuckers until later in the '70s and '80s (single coils have always been wax potted). Unpotted coils have a very dynamic and touch sensitive feel with a brighter edge, which is well suited to low-gain playing, while potted coils are much more practical for any playing style where high amounts of preamp gain and loud volume are used. See also: What is Wax Potting? We offer flat rate shipping on all retail orders, which is £6.95 for orders within the UK and £12.95 for all international orders. Occasionally, there are destinations that have particular issues with the security or speed of regular mail, so we do from time to time insist on using DHL courier delivery for those locations, which may carry an extra charge, based on the size and weight of the order. Should I Choose Alnico V or Ceramic for my bridge pickup? The Alnico V magnet offers up a huge, deep bottom end with rich, throaty mid range and warm highs. The ceramic magnet option adds more output, tightens the bass response and smoothes the mid range slightly with a brighter cut in the high end. Bare Knuckle Pickups accepts payments through a very secure gateway called "SagePay". This way all of your card details are safe and encrypted properly. SagePay accepts the following cards: Visa Debit Visa Mastercard Mastercard Debit Amex. Because we use SagePay we do not use PayPal. Miracle Man and 2 Trilogy Suite single coils. All of our HSS sets use the default options of 53mm pole.